No matter the size or complexity of a project, we can provide the right materials and services to get the job done. Our large selection of products ensures our customers they have choices when selecting materials. Visit us today! With 4,800 square feet of retail space, a determined couple - Paul Jr. and Rosaline - operated Dufrene Lumber Co. in 1955 in the small town of Cut Off, Louisiana. Delivery was limited to Lafourche Parish. The three-employee company grew over the years, and by 1985 the staff had increased to ten full-time employees. Paul III and Becky Dufrene purchased the family business then relocated to a larger site also in Cut Off, increasing the retail space and operations to 96,000 square feet of property. He also changed the name to Dufrene Building Materials, Inc.
Today the company has grown to over 200 employees and four locations. Dufrene Building Materials, Inc. occupies over 40 acres with over 200,000 square feet of covered storage space. With a fleet of 44 vehicles including seven 18-wheelers, we can offer local delivery as well as to the entire Gulf South, including Texas, Mississippi, Alabama and into Florida. 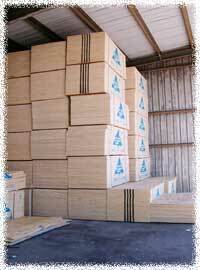 Dufrene Building Materials, Inc. is also affiliated with Triple Son Wholesale Timbers, Inc. A full fledge sawmill which can provide custom cut lumber up to 40 feet in length, offshore vessel deck boards(standard or custom notch), pilings and poles up to 60 feet in length, custom crane mats and vinyl sheet piling. Both companies are locally family owned and strive on customer service and satisfaction.